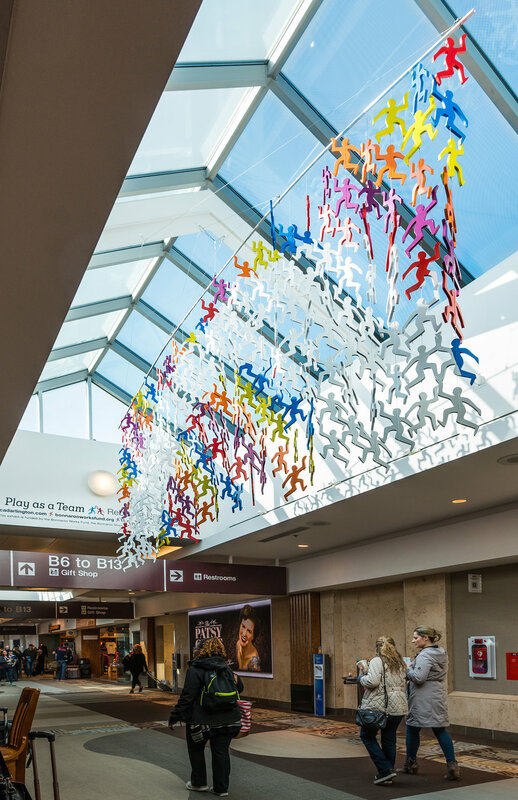 The artist call for the airport art committee asked to illustrate the yearly Bonnaroo Music Festival that takes place near Nashville.The design selected is based on a visual of the iconic Bonnaroo Music Arch at the epicenter of the festival. It represents the “Play as a Team” one of the clever mottos of the Bonnaroo Way. The symbolism cannot be lost with 205 playful figures depicting the entrance to Bonnaroo. The figures all form a cohesive eye pleasing pattern arranged in 26 vertical rows. Each row is suspended from 1/16” aircraft cable from a 24 ft long 1” aluminum pole. Each row independently spins. The colors are directly selected from the rainbow arch on-site. 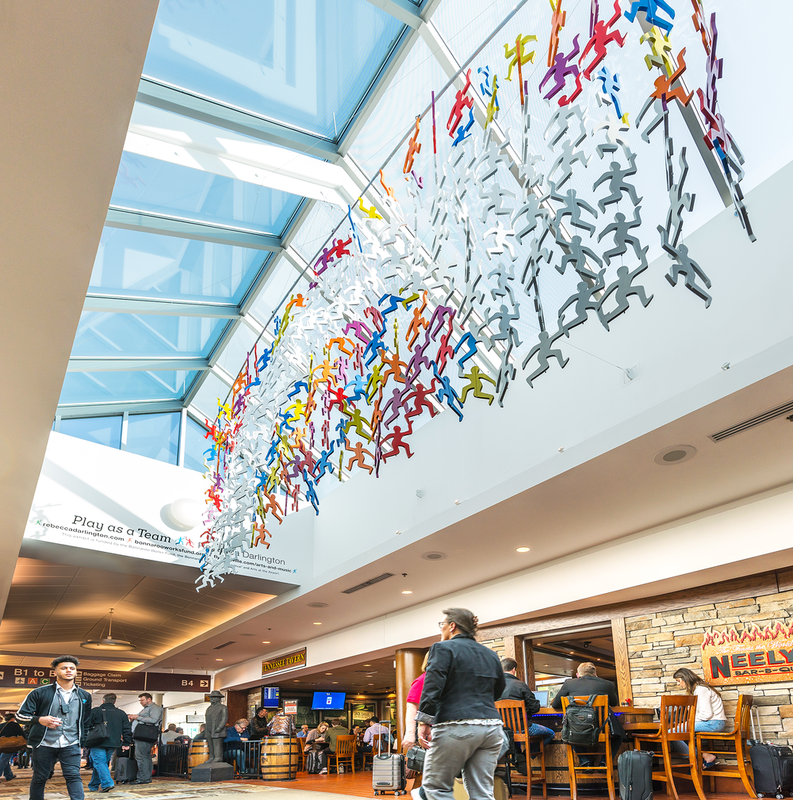 You can find it at the Nashville International Airport in Concourse B near Gate B4. Coincidentally it's where Delta delivers their New York passengers. Love that. The opening was in April 2018 and it will be up until Late February 2019. Drop me a note or photo if you happen to see it. 206 CnC router cutouts from insulation foam hanging to dry and cure. Late at night the Nashville Airport is a busy place. My team and I were ferried in through a system of secure doors with our 22 boxes at 8PM and we installed until we were finished at 1AM. 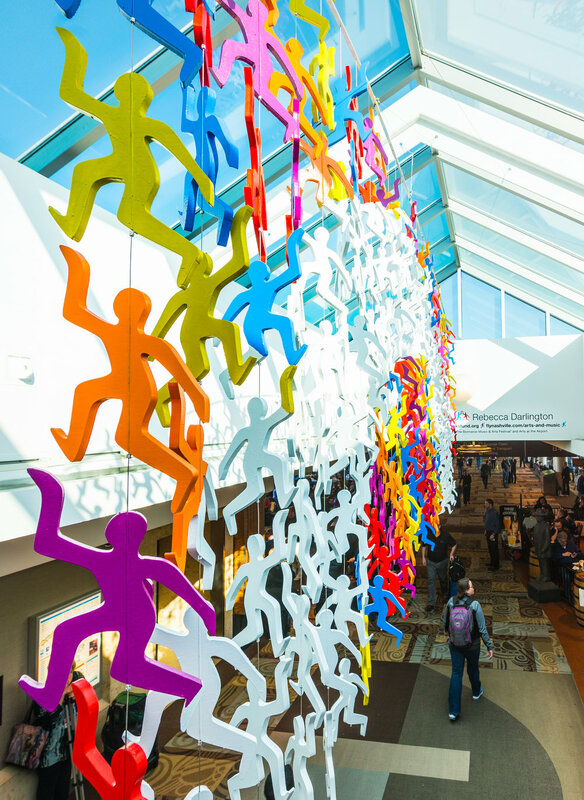 The airport staff was beyond helpful as some of them are artists themselves and understand all the potential intricacies of hanging a 24 ft x 8 ft mobile safely.